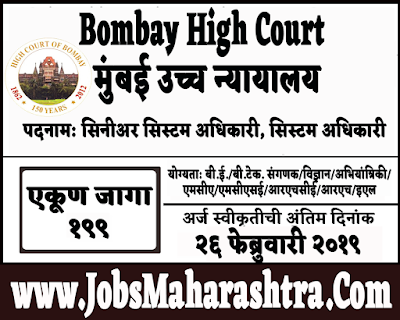 Mumbai High Court Recently Released notification for Senior System Officer & System Officers 199 posts. Eligible candidates can apply through online on Mumbai High Court official website before 26 February 2019. For more details like age limit, salary, how to apply, selection process please refer the below article. Candidates can fill up the online application form on the Mumbai High Court official website given in the important web link section. The candidates will be selected on the basis of educational qualification, experience and/or interview.